Hi Everyone! Today we start our Stamp Highlights with Playful Pups! Over the next few days, our Design Team will show you what they have done with this month's new release! It so fun to see what these doggies can do! This little pup looks a little blue! We love the background that Elena created, using so many of the smaller images from this set. 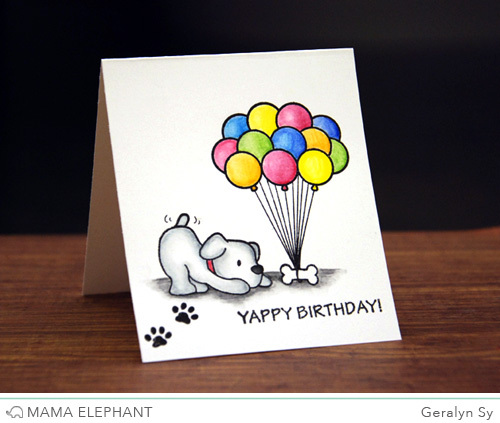 Geralyn gave the pup a little birthday gift by attaching some balloons from Up and Away to the bone, creating a very cute birthday card! Laura created masks for each of the pups to group them together and add a subtle ink blended sky & grass. 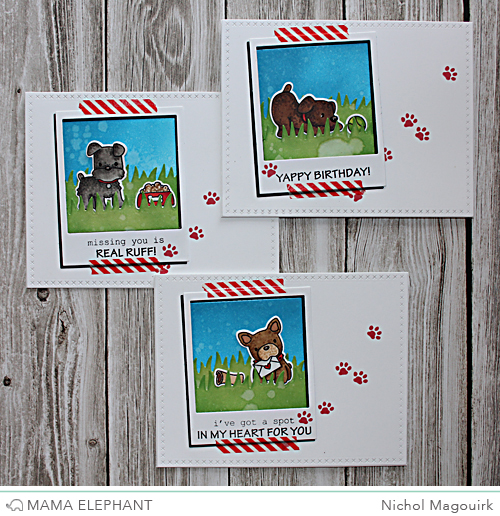 Nichol created a trio of framed puppy cards by creating small scenes inside the Polaroid Fun frames with the Grassy Trio Dies. 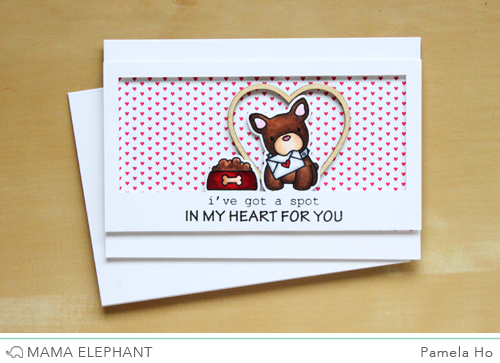 Pamela created a sweet partial-die cutting card and used a wooden heart frame to frame this playful pup! Nicole made this sweet shaker card using Femme Frames and Pretty Posh Pink Sequins! Thanks for joining us today as we highlight May's release! Come back tomorrow to see more! These are all so sweet. Nice set of puppies. How cute! These cards are just amazing, I especially love Elenas and Geralyns cute cards! SO much inspiration, hopefully my stamps will arrive tomorrow!! I love them all !! Fantastic Design Team. the little pups are darling. This set is adorable. It is definitely going to join my collection. I have been on the search for puppy and cat stamps and I've seen some I've liked but none that screamed BUY ME!! The second I seen the playful pups set I headed straight over and ordered mine. I REALLY hope that you do a cat/kitten set in a similar fashion as the pups. I seriously can't tell you enough how much I love these pups!!! Thank you to who ever designed these little guys. They actually designed a cat set prior to the dogs. Check out their website for more info. Oh my goodness these are just way too cute!!! Love it! The DT did an awesome job! Such fun...soooo cute....I can hardly stand it....I must have this stamp set....LOL....What's one more...right??? Love these pups and all the ideas for using them. They are way too cute! Stunning, all of them as always! Awwww your cards are all soooo cute. Thanks for sharing. These doggies are beyond adorable. Each card is so special!!!! What a wonderful set with cute images and sentiments! Way to go designers! Omgee this is absolutely my most favorite stamp set of all time! TFS and inspiring! This is one of the cutest, sweetest sets EVER. As a "dog-sitter" in my spare time, this set of stamps must come to live at my house. So darned cute, and I love all the talented design team's examples of how to use the set. Thank you for sharing your talents.